ZTreeWin is a text-mode file/directory manager for Windows. It has been developed as a successor to the legendary DOS file-managers of the past, which software vendors have abandoned, in todays GUI-centric computing world. the most powerful and easier to use file manager. You can even search all tag files for a word inside them without opening them one by one. woooooowwwwwwwww The possibilities are nearly endless. No other files manager can do that much. No other files manager is as fast. No other files managers can do as much! Like any powerful tools it takes a little use to is is worth it. If your serious about file management then you seriously need ZTreeWin and this beta has not given me any problems - it just gets better - and easier! To abuse a line from a song "...every little thing he does is magic...". I've been a user of XTree, and all its successors to date, and find it to be the most easily useful file manager. Windows Explorer is no match for this wonderful program. I have been Ztree user since its rebirth from Xtree. It is so powerful when you become familiar with it, that when I have to use a computer without Ztree I feel like trying to run in the mud. I clung to my copy of XTree until XTree Gold came out - I didn't like the latter and continued to use XTree until it no longer worked for me. Then I found ZTreeWin and I have never looked back. If I find a file-wrangling task I want to do, I just assume it is in there and go find it - I am seldom disappointed! ZTreeWin can be best described as a much better alternative to Windows Explorer. It is much much faster. It has many additional and useful functions. Everything having to do with viewing, searching and organising (copying, renaming, backing up) files and directories work much easier, quicker and stress-free with ZTree. For one particular task (quickly viewing the contents of text files with non .txt extensions ) I saved 2 -3 hours a day. But you must learn how to use it first. This takes some time and getting used to. It's however time well invested. I am glad that even though Norton bought out XtreeGold and killed it Kim Henkel created a new incarnation of it as ZTreeWin. Though I must say I never thought that Ztree was as popular as the reviews here on fileforum. Here is my experience with Ztree - "When All Else Fails Go To Ztree for Disk or File Management". Even though Windows 7 has about the best search feature I have experienced. When that fails it is time for Ztree because you can use wildcard characters. And if in your original search on Win& you made a syntax error you can check out whether or not you did in Ztree using wild cards. Some of the other reviewers here have said they cannot understand why more people don't use ZtreeWin. I think it is because those of us who were weaned on the DOS interface are very comfortable using keyboard commands. Those who arrived on the scene since may not have the keyboarding skills and might be thinking of the non-GUI text-based interface of ZtreeWin as a bit disorienting. Personally I love it and liken it to going into a technology store, and checking out stuff out in the back where they normally won't let you go. I would have given ZtreeWin a 5 star rating but I took 1 star off only because I would like to see one feature extended beyond what it does presently. I am referring to opening up a file's long filename, extension, date, attributes and size the long filename gets cut off and you need to keep switching back and forth between the long filename view and the file details view. Hope Kim can address this in a future upgrade. In my experience with ZtreeWin for over a decade at least Kim Henkel has been nothing but generous. He has NEVER demanded anything, and every time there is a major upgrade to ZtreeWin even then he has let us download the upgrade. It is only recently on the introduction of ZtreeWin 2x that he requested for a donation of $ 10. Given the degree of ZtreeWin's functionality when you are really in need and don't have time to try out a GUI file search. I count this aspect of the incredible utility of ZtreeWin as it's greatest selling point. And those tech-savvy folks who are uncomfortable with ZtreeWin's text-based interface, well they are missing out on the ability to dig deep into their hard disk. ZTree is BY FAR the program I used the most. For what it does, file management and search, it beats anything available. I like it so much that I've sent numerous donations throughout the past 10+ years, in addition to buying a license in 1998. I started with Xtree and moved over to Ztree when Xtree went away. I've been using Ztree since the EARLY 1.x days, when it was free, (sometime WELL before 1998, when I purchased a license). best version ever, i use it daily for file managment in fast and save way. Ok, let me chime in here too. I would say that ZTree does what it does about as well as IPOD does what it does well. Neither make eggs for you in the morning but for some things ZTree cannot (well, has not) been beaten. The Ease of Tagging, filtering and moving/finding etc is exceptional. All of us here should be able to relate to loosing files on the PC. With ZTree WHEN this happens the ZTree keyboard shortcuts help us find the newest files anywhere on the PC in seconds. So far I have found that this has not been beaten. I am always looking for programs to match the features of ZTree and am constantly making keyboard shortcut scripts in XYPlorer to mimic the ZTree ones. Especially the tagging, filtering and copy/moving of the files. I'd imagine that all you who don't like the ZTree interface are not the programmer/system explorer types who work with files for a living. If you are - you love ZTree. If not, you can probably find a file manager that can do more of what you need. For the future I believe that file managers that can do pictures, videos and music files well are the newest frontiers. I hate that many of the cool features for manipulating these type of files go to specality programs. Comnon File manager writers....incorporate all the cool funcitons and give us a one stop shop! If the author sold this program as having free lifetime updates, and then changed it later and charges you again, that is fraud. I don't care how good a program is, it does not give the author a right to do that. Even though it's probably not worth the trouble and money a lawsuit could most certainly be filed. Aside from that, $30 for a program that looks like something from 1985, lol. I was user of XTREE, it helped me understand the structure of the DOS and later WINDOWS OS. It helped to maintain the OS and manipulate files (the tagging feature of file is essential in this). This kind of filemanager is essential for an OS. I was very happy that ZTreeWin continued when XTREE stopped. I had already a key in 1999. I am happy that ZTreeWin is still alive and I am happy to spend the requested small payment to continue to use this program. A pity that this program is not available in Linux (so I have to stay with Windows). Yes, sadly, it is true that this latest upgrade requires an added payment. It is a pity the author was unable to keep the promise of "free for live". You're given a superior program, for a small cost, and want more, more, MORE. Get a life. You're not forced to upgrade. Many of the features are NOT even used, by anyone. And the author does go out of the way to inform users of all changes, including the added cost, and that this new version will cost you a few more dollars. CHILL. If you are a network manager or a programmer looking to kick the competitions backside mastery of this tool will make you godlike. Do in seconds what other sad trolls can only dream of. Treat millions of files on multiple servers and drives with contempt. Spectacularly powerful multiple file spec filters and raw search capabilities with global tags and the ability to replicate and consolidate complex directories to a single path are huge advantages. Throw in just about every conceivable file management feature including hex edit and easy batch script generation and you might understand why users love it sooo much. If the author would add the ability to sort, search and tag by access date and creation date I would say it was perfect. This program has been my edge over the competition for many years. Great stuff!!! ZTreeWin is without doubt the most used app on my computer. 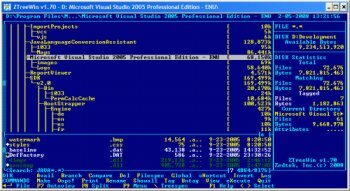 I understand that if you are new to computers it can be challenging, in particular given the great alternatives like Total Commander. Nevertheless, if you are dealing with lots of files every day (like truly yours), it's difficult to find any other tool that makes working with files easier and faster than ZTreeWin.